A charcoal grill is the standard "go-to" grill that most of us know and love. It is the classic, the original, its the bread-and-butter of outdoor grilling. A charcoal barbecue is simple and yet produces delicious grilled foods. The beauty of a charcoal barbecue or grill is its simplicity. No fancy electronics, pipes, tubes, knobs, or gadgets, just plain, simple cooking with fire fun. Simplicity - It's just a metal box that holds your hot coals. Its that simple. Nothing fancy or complicated. Easy of use - If you know a few simple tricks, cooking with a charcoal barbecue is a snap. Just get that charcoal lit and go. 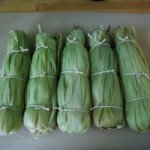 The flavors - The wood smoke flavors of burning charcoal on a charcoal barbecue or grill enhance the food you are cooking. A gas grill imparts no flavor unless you add smoking woods. Charcoal itself imparts a smokey flavor and aroma AND you have the option to add smoking woods as well if you so choose. Only real firewood grilling may be a bit better than charcoal, but if you use real lump wood charcoal that is even up for argument. Choice of fuels - There are probably as many different types of charcoal as there are types of grills! Each brand of charcoal is different. The ubiquitous Kingsford charcoal briquets are easy, inexpensive, easy to find and long burning. However, they are processed and made with some chemicals to make them burn better and longer. But you've got options with charcoal! The Fire Pit and Grilling Guru prefers lump charcoal, made from actual large chunks of firewood that has been charcoal-ized. No processing or chemicals added. They tend to be a bit more expensive and don't burn as long, but the intense heat they give and the pure, clean wood flavors they impart are worth it! Inexpensive - Charcoal barbecues tend to be less expensive, even at the upper end, than top-of-the-line gas and natural gas grills. Charcoal is generally inexpensive, although real lump charcoal can be quite more expensive. 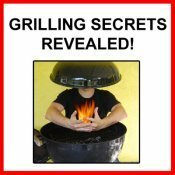 Are there any disadvantages to cooking on a charcoal grill? Charcoal is messy - Big bags, black soot, yes, charcoal can get messy and a hassle to lug around. Starting the fire - A charcoal grill takes time to get hot. Whether you use a chimney charcoal starter, lighter fluid or an electric charcoal igniter, coals take a while to catch and reach a point that they are ready to cook on. However, with a little practice and proper use of charcoal starters such as a charcoal chimney you can be ready to grill very fast, if not quite as fast as a gas grill. After you are done cooking, the coals stay hot for a long time, often all night long! While this is not as much work as starting a real firewood fire for fire pit cooking, compared to a gas grill it can be an inconvenience if time is of the essence. Gas grills are quick on and quick off. Form - The most common type of charcoal grills are the Weber charcoal grill, also known as a kettle grill, as seen above. Whether from Weber or another company, many basic charcoal grills are this standard kettle shape. They have a grate in the bottom to hold the coals and a cooking grate that is placed on top. The cooking surface is round. Other charcoal barbecues come in rectangular shapes, such as this Char-Broil charcoal grill here, which have a large rectangular cooking surface. There is nothing particularly different about the different shapes. Size - While the shape of your grill may not matter too much, the size is an important consideration. While bigger may seem better since you can fit more food on your grill at once, you should consider that a large charcoal grill needs much more charcoal! A small grill may only need a small pile of coals while a large grill can use practically a whole bag of charcoal to get it up to cooking temperature. Keep this in mind if you are rarely going to be cooking for large groups so that you don't waste money on lots of charcoal if you are just cooking for yourself or a few people. There are also portable charcoal grills for camping or picnics. Features - While a basic kettle grill is sufficient for most tasks, there are some features to consider in buying a charcoal grill which may make your life easier. Side tables or working surfaces make staging food and food preparation much easier. A hinged grate or charcoal access door (as seen in the Char-Broil grill above) is helpful if you need to add coals or tend your fire while cooking. A built in thermometer in the lid helps to determine if your grill is hot enough to start cooking. Some grills have a tool rack which allows you to hang your barbecue tools for easy access. 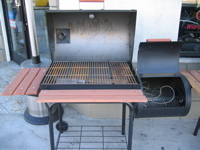 Additional Cooking Styles - Some charcoal grills, like this one pictured here, double as a smoker cooker, making slow-roasted, smoked meat dishes a snap. Some grills also come with a rotisserie or you can attach an optional rotisserie kit. 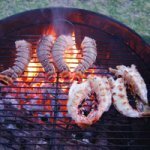 I hope that all helps you decide if you want to go with a charcoal barbecue and some of the features you should consider when buying. To learn more about using charcoal see our charcoal page. You really can't go wrong with a classic charcoal barbecue or grill. Your food and mouth with thank you! Done learning about charcoal grill? 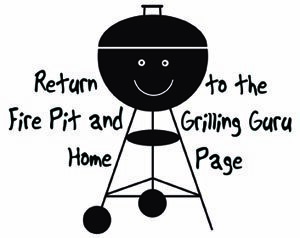 Return to the Grill & Barbecue page.